‘Days of Our Lives’ actor Eric Martsolf [Brady Black] has joined with ‘General Hospital’s’ Bryan Craig [Morgan Corinthos] for a joint appearance at Twilight Saga. This is a benefit for Samantha’s Friends. Bryan’s former GH co-star, Kelly Thiebaud [Dr. Britt Westbourne will join her fiancé in support of the non-profit charity. Other soap opera stars scheduled to appear are past and present DOOL actors Martha Madison [Belle Black], Patrika Darbo [Nancy Wesley] and Patsy Pease [Kimberly Brady]. Patrika [Mickey Walker] and Patsy [Lola Baker] now star in the web series The Bay. Patsy has been nominated for her first 2016 Daytime Emmy in the Outstanding Actress in a Digital Daytime Drama. Samantha’s Frienda is a non-profit organization that helps individuals challenged by disabilities such as autism, stroke, combat injuries and other catastrophic illness, gain independence and companionship with the assistance of a service canine. 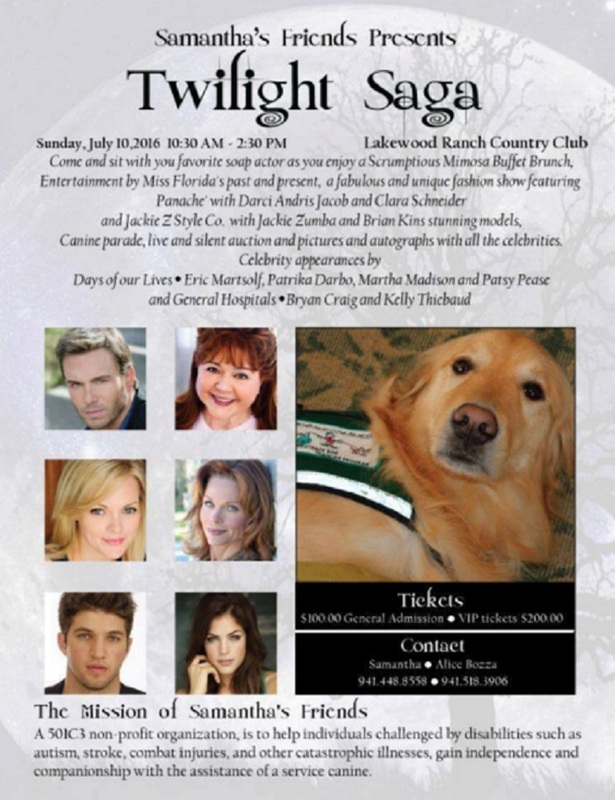 The Twilight Saga event will be held on Sunday, July 30 from 10:30am until 2:30pm at the Lakewood Ranch Country Club in Lakewood Ranch, Florida. The event invitation reads, “Come sit with your favorite soap actor as you enjoy a scrumptious mimosa buffet brunch, entertainment by Miss Florida’s past and present, a fabulous and unique fashion show.” There will also be a canine parade, live and silent auction and pictures and autographs with all the celebrities. Days of Our Lives, General Hospital and The Bay fans should call Samantha at (914) 448-8558 or Alice at (914) 518-3906 for information on how to purchase tickets. $100 general admission tickets and $200 VIP tickets are available for the Twilight Saga brunch featuring Eric Martsolf and Bryan Craig to benefit Samantha’s Friends.